Adobe Labs keeps pumping out wonderfulness on a weekly basis. 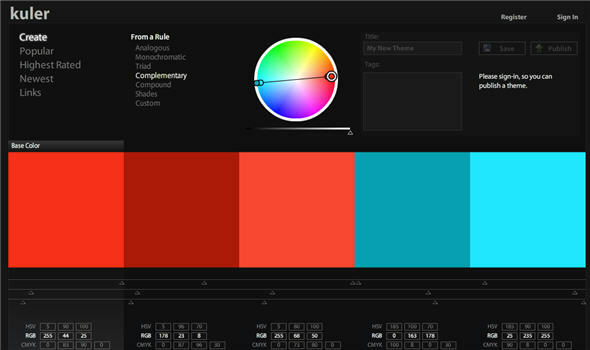 The latest treat is called kuler, an online color theme app. You’ve seen plenty of these before if you do any Web work, but this is different. First, the interface is absolutely gorgeous and intuitive; even if you’re as color-clueless as I am, you’ll love exploring different color themes. Second, it’s built entirely in Flash, making it far more dynamic. Third, and most importantly, you can share the color themes you create. Navigate by popularity, rating, or tag, then open a color theme and edit it yourself, or publish your own. When you’ve found one you like, you can export to Adobe CS2 apps (or just make a note of the color values, of course). Check it out. Flash 9 is required (and if you don’t have it yet, it’s time — it’s out of beta). I’m always looking for color inspiration for my visuals and designs, so I’ll be back.